Khufu was the second pharaoh of the fourth dynasty of Ancient Egypt who ruled for twenty three years, between 2589 and 2566 BCE. 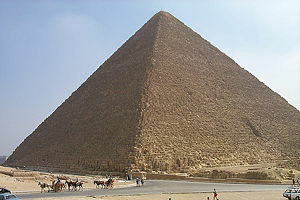 He is famous for ordering the construction of the Great Pyramid at Giza, his tomb and one of the Seven Wonders of the Ancient World. The Greeks named him Cheops. The name Khufu is a shortened version of the Egyptian phrase Khnum-kuefui which means "Khnum protects me", being Khnum the name of the local god of Elephantine, an island near the first Nile cataract. Very little is known about Khufu's life and reign. He was the son and successor of Sneferu and queen Hetepheres I and he had at least three wives. His main wife was Meritites I, who bore him a son named Kewab and a daughter, Hetepheres II. Queen Henutsen, another of his wives, seems to be the mother of Khafre (the ruler associated with the Second Pyramid at Giza) and of prince Khufukhaf. A story recorded in the Westcar Papyrus tells how Khufu was fascinated by magician named Djedi, who could return to life a creature who had been beheaded. In this tale Khufu asks for a prisoner to be brought to him and decapitated, so that the magician could perform his alleged ability. Djedi objects to the request on grounds that the trick shouldn’t been practised on a human being, managing to convince the king. He then demonstrates his trick on a goose. .
Herodotus, who visited Egypt in the middle of the 4th century BCE and recorded his journey on Book 2 of his Histories, portrays Khufu as a cruel ruler who led his people into misery. According to the Greek historian, Khufu had all the temples closed and ordered all Egyptians to work on the building of his pyramid . Herodotus also wrote that after spending all his fortune, Khufu sent one of his daughters to work as a prostitute in a brothel in order to raise money for his pyramid. . The authenticity of these stories is considered doubtful. Although it appears that Khufu wasn't as popular as his father and his grandfather Djoser, his funerary cult was still practiced in the time of the twenty-sixth dynasty and even during the roman period. The only surviving representation of Khufu is a tiny ivory statuette (7.5 cm high), which portrays him seated on a throne holding a flail in his right hand and wearing the red crown of Lower Egypt. The statuette was found at the temple of Khentimentiu at Abydos by Flinders Petrie and it is now at display in the Egyptian Museum in Cairo. Several ships made of cedar wood were discovered in a pit near Khufu’s pyramid in 1954. It is believed that these ships were placed there to be used by the deceased pharaoh in his journey through the netherworld. One of these ships was reconstructed and is now at display in a special museum built near the pyramid. Khufu's successor was Radjedef, who killed his brother Kewab, the rightful heir to the Egyptian throne. This page was last modified 04:37, 15 September 2013.